You are Here:Home/NPA AND GUANGZHOU PORT AUTHORITY (GPA) SIGN (MoU) ON EFFICIENT PORT OPERATIONS. NPA AND GUANGZHOU PORT AUTHORITY (GPA) SIGN (MoU) ON EFFICIENT PORT OPERATIONS. 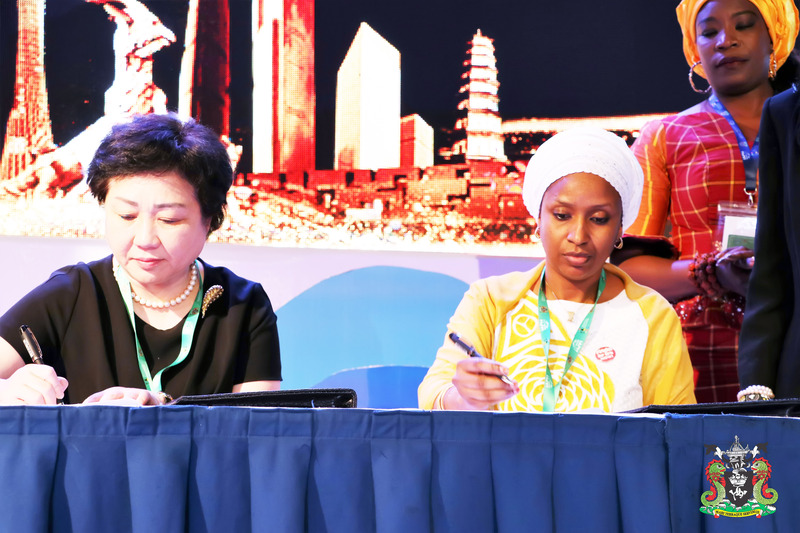 The Management of the Nigerian Ports Authority (NPA) on behalf of the Federal Republic of Nigeria and the Guangzhou Port Authority, the largest comprehensive hub Port in Southern China have entered into a sister Port Memorandum of Understanding (MoU) concerning greater efficient port operations. 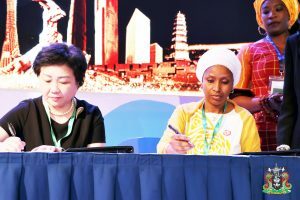 In order to strengthen the collaboration and foster greater relationship between the Nigerian Port Authority (NPA) and the Guangzhou Port Authority (GPA), the MD Nigeria Port Authority, Hadiza Bala Usman (right) and the Deputy Director General, Guangzhou Port Authority, China Yue Yuan (left) during the signing of the memorandum of understanding (MoU) on establishing sister Port relationship between the two ports at the 2018 IAPH Conference in Abuja. The MoU which was signed on the 18th day of the month of September in the year 2018 at the ongoing maiden African Regional Conference of the International Association of Ports and Harbour (IAPH) at Transcorp Hilton Hotel Abuja would strengthen communication and cooperation thereby enabling synergy and collaboration amongst the two ports authorities. Guangzhou is the main transit Port of raw materials, energy supplies and Foreign Trade as well as the key support chain in Southern Region of China. Other subjects captured in the MoU would comprise of joint promotion of effective logistics in trade facilitation in order to enhance Port capacity for the service of regional economic growth on non -committal basis with information sharing being the main pivot and foundation of all consultations. Furthermore, the MoU would prioritize the advancement of green Port development and environmental protection such as energy saving and emission reduction. It would uphold the establishment of an information exchange mechanism in order to enshrine new developments in Port operation with modern information technology driving the process are imbibed across board. There are also the expectations of training programs exchange for management staff and technical specialists and other areas of expertise such as loading and uploading of machinery and equipment, Electrical facilities, safety engineering and information technology applications. The operation of the MoU is for a duration of 2 years in the first instance from the date the parties appended signatures on mutual beneficiary basis renewable yearly. The two parties would keep to confidentiality of information exchange, a requirement spelt out to remain valid even after the expiration, releasing or termination of the MoU. The document would be terminated when any of the parties writes the other stating and giving 2 weeks notice or by way of the afore stated situation, “FORCE MAJEURE”. Upon the dissolution of the MoU, the parties resolved to promptly and adequately settle disputes amicably. The collaboration was borne out of distinctive desire of the parties at ensuring they attain competitive advantage prioritizing greater and efficient customer service amidst the tenets of best practices. 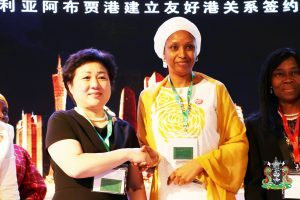 The Managing Director NPA, Hadiza Bala Usman endorsed on behalf of the Federal Republic of Nigeria while deputy director general, GPA Yuan Yue (Ann) signed for the people’s Republic of China. The event was witnessed by the Honourable Minister of Transportation, Right Honourable Rotimi Chibuike Amechi. For: GM Corporate & Strategic Communications.